The text used is Hero Alexandrinus, Opera ii, ed. by L. Nix and W. Schmidt (Leipzig: Teubner, 1900). I refer to the edition as N&S. The general diagrams are based on Leiden 983, cod. 51 (i), with thanks to Joyce van Leeuwen and Ken Saito. Prop. ii 40: the center of weight of a triangle with known weights suspended from it corners. Prop. ii 41: the center of weight of a polygon with known weights suspended from it corners. 35 And it might be required for us also to show things that we need for pulling and pressing, which are not like those we discussed in the treatise previous to this one. And because these last things produce greater conviction than those, Archimedes and others made them clear. And first of all, we explain how we find the center of weight of a triangle equal in thickness and weight. (diagram 1) So then let the known triangle be triangle ABG, and (diagram 2) let us cut line BG in halves at point D, and let us join points AD. Then we have constructed the triangle on straight-line AD which does not incline in any direction, because triangles ABD, ADG are equal. (diagram 3) And also if we cut line AG at point E and we join the points BE, then we have also constructed the triangle on line BE, which does not incline in any direction. (diagram 4) Then the triangle is consequently fixed on every one of the lines AD, BE which balance its parts and does not incline in any direction.Then a point in common with them separates them. It is the center of this weight, and it is point Z. (diagram 5) We might then be required to imagine point Z in the middle of the of thickness of triangle ABG. (diagram 6) Then it is observed by us that if we join the points AD and cut line AD at point Z with the two segments, one of which, that is AZ, is double ZD, and then point Z is the center of weight. 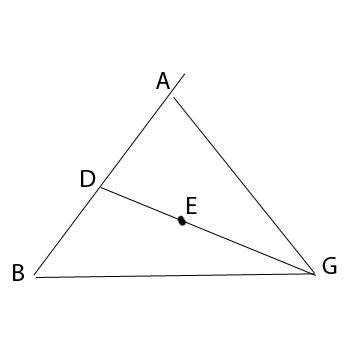 (diagram 7) For if we join points DE, then line AB is parallel to line DE, because its cuts are at points D, E. Therefore, line AG to GE is proportional to AB to ED, and line AG is double line GE. 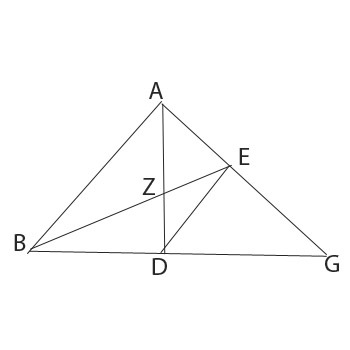 Therefore, line AB is double ED, and line AB to ED is as line AZ to DZ. 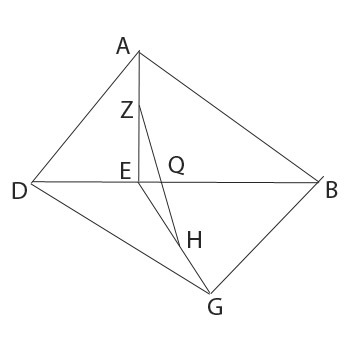 (diagram 8) Therefore, line AZ is double ZD, because of the fact that figures ABZ and DZE have equal angles. Corollary: (diagram 9) If we draw HQ through Z a parallel to BG, then ZH = ZQ. For triangle, HAZ is similar to BAD amd BAG is similar to HAQ. Hence, BG : HQ = BA : HA = BD : HZ. Thus, BG : BD = HQ : HZ. But BD is half of AG. Hence, HZ is half of HQ. (diagram 10) The theorem referred to in Archimedes, Quadrature of the Parabola 6, is given for a right triangle. (diagram 2) We also want to find it in the quadrilateral.Then let the known quadrilateral be ABGD, and (diagram 3) let us join BD and let us divide it in halves at point E, and let us join lines AE, EG, and let us cut them at points Z, H such that AZ is double ZE and HG is double HE. (diagram 4) Then the center of triangle ABD is at point Z, and the center of triangle BDG is at point H. (diagram 5) We do not then find it any different in our imagination if the weight of triangle ABD, the whole of it, is at point Z and also the weight of triangle BGD is at point H. So then line ZH comes to be a balance with respect to its extremities, namely, these two magnitudes. (diagram 6 = alt. gen. diag.) Then if we divide line ZH at point Q in a division such that QH to ZQ is as the weight of Z, which is the weight of triangle ABD, to the weight of H, which is the weight of triangle BDG, point Q, which will balance the two weights at it, will be the center of this quadrilateral. 37 (diagram 1) We also want to demonstrate this for pentagon ABGDE. (diagram 2) Then let us join BE and let us take the center of weight of triangle ABE and let us imagine it at point Z, (diagram 3) Then let us join BE and let us take the center of weight of triangle ABE and let us and let the center of weight of quadrilateral BGDE be at point H and let us join both points ZH and let us cut line ZH with segments such that segment HQ to QZ is as the weight of triangle ABE to the weight of quadrilateral BGDE. (diagram 4) Then point Q is the center of weight of figure ABGDE and it is required that we imagine this in every figure of many sides. The following theorem concerns the distribution of support for a flat body. 38 (diagram 1) We want to demonstrate that if triangle ABG is equal in thickness and weight, and the sides subtending the points ABG are equal in position, how we will derive the amount of weight which every one of them carries from triangle ABG. Then, we divide line BG in halves at point D, and we join points AD and we cut line AD into two segments at point E such that segment AE is double ED. Then point E is the center of the entirety of the weight of the triangle. (diagram 2) It is then required that we cut it at the sides. And if we imagine line AD as balancing the inclination, it will hang at point E, so that the weight which is at D is double the weight which is at A because line AE is double line ED. (diagram 3) Then if we imagine the weight which is at D as divided onto points BG, then the line BG is in balance with each one of points BG, i.e., half of the weight which is at D, because lines BD, DG are equal. And the weight which is at D is double the weight which is at A. Therefore, the weights which are at points ABG are equal, and therefore the sides carry equal weights. 39 (diagram 1) And also let there be a a triangle ABG equal in weight and thickness with sides equal in position. And let point E be situated wherever it is placed. Then we want to derive how much every one of the sides carries from weight E. (diagram 2) Then let us join EA and extend it to D. (diagram 3) And let us divide the weight which is at E into two segments. 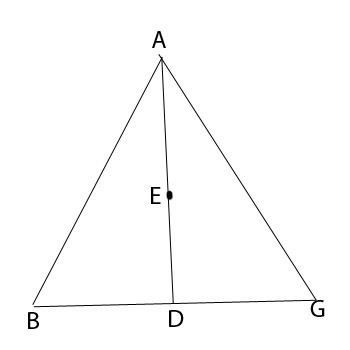 If the triangle is positioned on line AD in balance, then the weight which is at D to the weight which is at A is proportional to line AE to line ED. 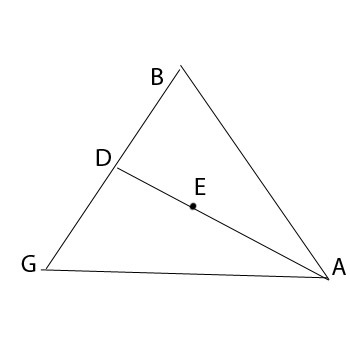 (diagram 4) And let us divide the weight which is at D such that if BG is hung, then weight G to weight B is proportional to line BD to line DG, and the weight which is at D is expressed. Therefore the two weights which are at BG are expressed, and because the weight which is at A is expressed, therefore the two weights which are at the sides are expressed. The expression at the end, ‘expressed’, translated the Greek, ‘dedomenon (given)’, and is in the form of a lemma for an analysis. 40 (diagram 1) If triangle ABG exists and there are weights which are balanced hanging at points ABG, we want to derive a point within the triangle (see note). (diagram 2) When the triangle hangs from it in balance, let us cut line AB at point D such that line BD to line DA is as the weight which is at A to the weight which is at B. Then the center of collected weight of the two points is on point D. (diagram 3) Then let us join points DG. with line DG, let us cut it at point E such that line GE to line ED is proportional to the weight of D to the weight of G. Then point E is the center of the weights collected from them. Therefore, it is the point of suspension. Note: there is a misprint in N&S, 197.5, dâjil (deceiving), which makes no sense, for dâkhil (being inside), which is correct in the Leiden mss. 41 We want to show this in a figure of many sides. (diagram 1) Then, let there be a figure ABGDE of many sides, and let us suspend on points ABGDE known weights. (diagram 2) And let us cut line AB at point Z such that line BZ to ZA is proportional to weight A to weight B. 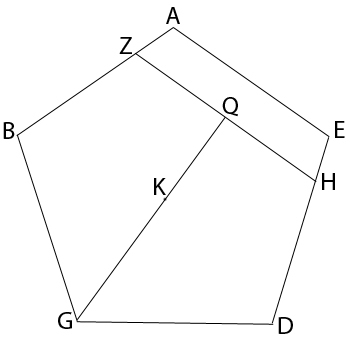 Then point Z is the center of the two weights at AB. (diagram 3) And let us also cut line DE at point H such that line DH to line HE is proportional to weight E to weight D. Then point H is the center of the weight collected from points ED. (diagram 4) And let us join ZH and let us cut it point H such that the collection of AB to the collection of DE is proportional to HQ to QZ. 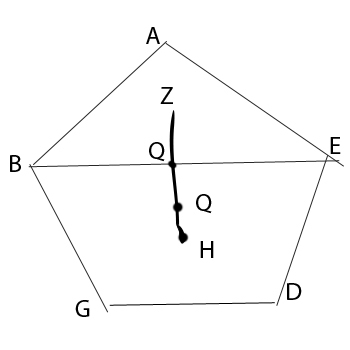 Then point Q is the center of weight collected from points ABDE. (diagram 5) And let us join points GQ. With line GQ, let us cut it at point K such that line GI to line KQ is as weight ABDE to weight G. Therefore point K is the center of weight of the suspended collection. on the Hoisting of Heavy Things is complete.